Rooted in the timeless wisdom of the yogic sciences, Isha Kriya is a simple yet potent process created by yogi and mystic, Sadhguru. Isha Kriya is free, simple, and easy to practice. Available as a guided meditation with an instructional video and downloadable instructions, as well as through live classroom sessions, it has the potential to transform the life of anyone who is willing to invest just 12 minutes a day. “Isha” refers to that which is the source of creation; “kriya” literally means “internal action.” The purpose of Isha Kriya is to help an individual get in touch with the source of their existence, to create life according to theirown wish and vision. Daily practice of Isha Kriya brings health, dynamism, peace and wellbeing. It is a powerful tool to cope with the hectic pace of modern life. It is the vision of Sadhguru to offer “one drop of spirituality” to every individual. Through the Isha Kriya guided meditation, the possibilities of a spiritual process, which were once available only to yogis and ascetics, are now being offered to every human being in the comfort of their own home. 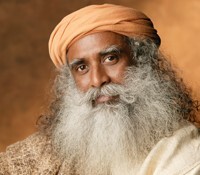 Sadhguru, a yogi, mystic, poet and visionary humanitarian, is a spiritual master with a difference. His life and work are a possibility for each individual to experience the peace and joy that pervades the core of every human being. It is Sadhguru’s vision that every one receives ‘one-drop of spirituality', allowing them to transform their lives and take their destiny into their hands. There is no dearth of guided meditation techniques on the market today. What makes Isha Kriya special is its simplicity and effectiveness. It does not require you to sit through a program to learn it, but can be taught to anyone, by anyone, anywhere, in a short time. 12 to 18 minutes of practice per day is all it takes to bring a profound transformation in your life. In the following article, Sadhguru explains how meditation isn’t something that you do. Rather, meditativeness is a quality that can blossom within us. Sadhguru: The moment we utter the word “meditation,” there are all kinds of misconceptions about it. First of all, the English word “meditation” doesn’t mean anything in the sense, if you close your eyes and sit, in English we call it “meditation.” You can sit with your eyes closed and do many things. There are many dimensions. You can do japa, tapa, dharana, dhyana, samadhi, shoonya. Or you might have just mastered the art of sleeping in vertical postures! So what is this thing that we call as meditation? Generally we assume that people are referring to what is known as dhyan or dhyana. In that context of referring to dhyan as meditation, it is not something that you can do. Nobody can do meditation. The reason why most people who have tried meditation have come to the conclusion that it’s very difficult or impossible is because they are trying to do it. You cannot do meditation but you can become meditative. Meditation is a certain quality. It is not a certain act. If you cultivate your body, your mind, your energies and your emotions to a certain level of maturity, meditation will naturally happen. It is just like if you keep the soil fertile, if you give it the necessary manure and water and if the right kind of seed is there, it will grow and bloom into flowers and fruits. Flowers and fruits will come out of a plant not because you want it, but simply because you created the necessary, conducive atmosphere. Similarly, if you create the necessary atmosphere within yourself, on all the four dimensions of who you are, then meditation will naturally flower within you. It is a certain fragrance that one can enjoy within himself. The mind does not like meditation because if you keep the body still, the mind will also naturally become still. This is why so much stress has been laid in yoga on hatha yoga and asanas. If you just learn how to keep your body absolutely still, then your mind will also become still. I want you to just observe yourself and see how many unnecessary movements your body makes when you stand, sit or speak. If you look at your life, you will see that more than half the time is taken up in these things that you yourself don’t care for. If you keep the body still, the mind will slowly start collapsing and the mind knows that it will become enslaved if it allows this. The main aspect of meditation is, right now your mind is the boss and you are the slave. As you meditate and become more meditative, you will become the boss and your mind will become the slave and that is how it should always be. If you don’t know how to keep the mind as a slave, it will put you through all kinds of endless suffering. If you allow the mind to rule, it is a terrible master. But as a slave, the mind is wonderful – it is a miraculous slave. "Thanks, Sadhguru, for helping me. I took the Inner Engineering course last July in Florida and came away settled and at peace. But after a knee replacement surgery in December, my whole body and my mind has been so difficult to deal with. Just listening to the Isha Kriya has made it possible to feel that same peace again." “I just practiced the Isha Kriya meditation and was surprised how powerful this meditation with Sadhguru is – even through an online video! I certainly felt a sense of inner peace, balance and a separation from attachment." "Meditation" or "Dhyana" means to go beyond the limitations of the physical body and the mind. Only when you transcend the limited perspective of the body and the mind do you have a complete dimension of life within you. When you are identified as the body, your whole life is only about survival. Your whole perspective of life will be simply survival. When you are identified as the mind, your whole perspective is enslaved to the social perspective, to the religious perspective, to the family perspective. You can't look beyond that. Only when you become free from the modifications of your own mind will you know the dimension of the beyond. Can you see that this body and this mind are not yours? It is something that you have accumulated over a period of time. Your body is just a heap of food you have eaten; your mind is just a heap of impressions you have gathered from the outside. What you have accumulated you handled well, it is your property. Like your home and your bank balance, you have a body and a mind. You have a good bank balance, a good body and a good mind. Good! This is needed to live a good life. But it is not sufficient. It is not fulfilling yet. No human being will ever be fulfilled by these things. They will only make his life comfortable and conducive. Especially if you see Western society, everything that you are dreaming of, every average citizen has. But do you think they are fulfilled, that they are blissful? Definitely not! Nowhere near bliss. So Dhyana is to transcend the limitations of body and mind, and you begin to experience yourself in a much deeper dimension. Your instruments, body and mind are okay to live in this world for survival. But life will not be fulfilled with them. And if you don't know who you are, are you capable of knowing what the world is? If you want to know the true quality of who you are, only if you transcend the limitations of your body and mind can there be a possibility for you to experience it. Yoga and Dhyana are scientific tools, which help you to transcend the limitations of your body and mind and experience the true quality of who you are. Without experiencing this, just eating, sleeping, reproducing and dying, your life will not be fulfilled with these. All those things are needed in your life. But our life is not complete because of these, even if you have fulfilled all these fully. This is because the quality of a human being has crossed a certain boundary of awareness. It has to seek something more, otherwise it will never be satisfied. It has to become unlimited. So Dhyana or meditation is a way of moving into the unlimited dimension of who you are.